After a weekend of replacing suspension bits (struts, mounts, bushings, etc), my last task was to remove the dogbone mount and replace it with a new one. 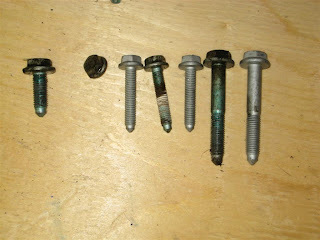 I got four of the five bolts out, only to have the fifth snap off at the head. 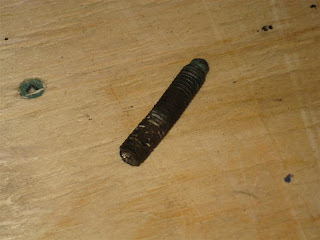 The bolt has completely corroded itself into the mount's bolt-hole, and no amount of Roost-off is helping get it out. Tried hammering, prying, etc, for an hour or so, but no luck. H is going to bring over his torch - hopefully that'll work. Update: I ended up jamming a cold chisel using a jack under the side that would move, then hammering some more on the stuck end, and prying up while hammering on the stuck end. Eventually it started to move and came off. The corrosion was fierce! I cleaned out the threaded holes with anti-rust stuff and brake cleaner, then blew them out with compressed air. I used anti-seize when putting it all back together, and torqued accordingly. 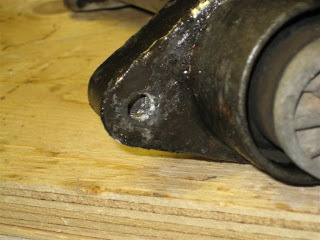 The first two pictures are of the mount itself - the part that attaches to the subframe. 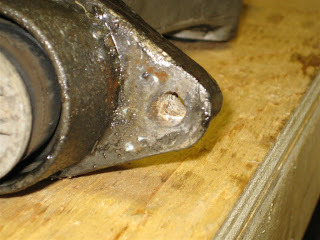 Second two are of the bolt after getting it out of the subframe/mount, and the collection of bolts/replacements. 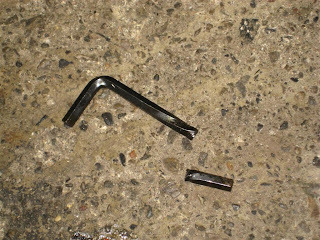 Last one is of a Princess Auto allen key that failed spectacularly - managed to twist it 360 degrees with my bare hands and a pipe.